In the following I assume you are somewhat familiar with using the Raspberry Pi 2. You know how to open and edit files and how to use the terminal. Start with standard Raspbian Jessie image that is fully up to date and configured to run the desktop. Also make sure to have the correct audio output selected in raspi-config, otherwise you will not hear any audio. The source code is now located in the cutesdr-code subdirectory. Wait for the build to finish, when done you should have a CuteSdr executable . 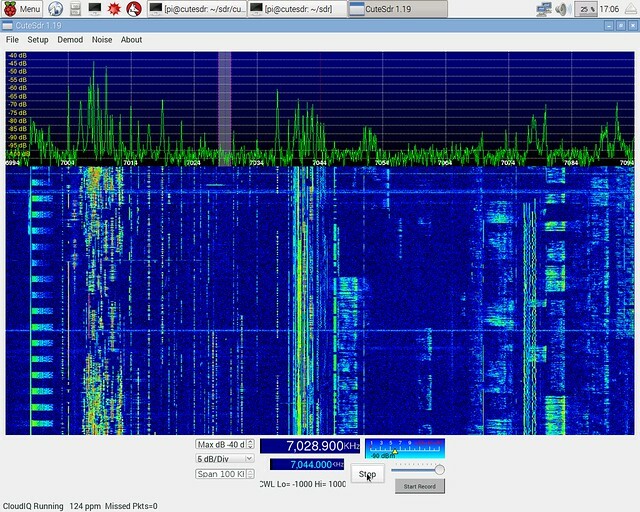 Start with network settings and find your Cloud-IQ SDR, or any other RFSpace networked SDR. The audio settings should be good as they are. It will run at about 30 % CPU load up to 500 kHz bandwidth. If compiled with double precision it will only work up to 200 kHz. Updated to take latest code changes into account. The code can now be built without modifications.